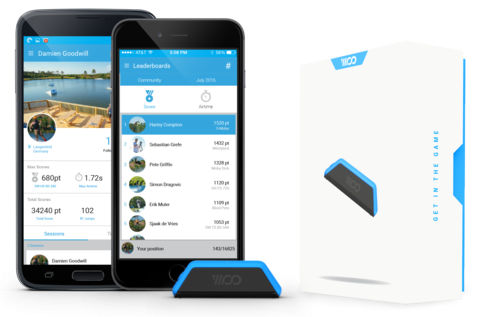 Produktinformationen "WOO Sports Woo 2.0 Kite & Wake"
New for WOO 2.0, wakeboarders can now create session reports, log tricks in their tricktionary, and share sessions with friends anywhere in the world! Get a high score on a specific trick variation, and try to complete the WOO tricktionary. WOO will detect regular vs. switch, heelside vs. toeside, and frontside vs. backside tricks! Every jump from every session is recorded to help you track your riding over time. See your riding progress as you log new tricks, and boost your trick scores! Challenge your friends around the world to keep the competitive vibes flowing every day of the week. Follow friends and track all their session to see how they’re keeping up! When you're back at the dock, sync up your WOO via Bluetooth with your phone and download your session report! What gear were you riding? What obstacles did you hit? What's the name of your team? Simply add a hashtag to your session description to create a custom leaderboard! Simply clip the WOO Sensor onto your board and go ride. The WOO tracks every jump, including height, airtime, trick (in Freestyle mode) and more! NOTE: Smartphones are not included in the delivery! This is just a sample picture, that you can connect the Woo with Android and Apple Phones! Weiterführende Links zu "WOO Sports Woo 2.0 Kite & Wake"